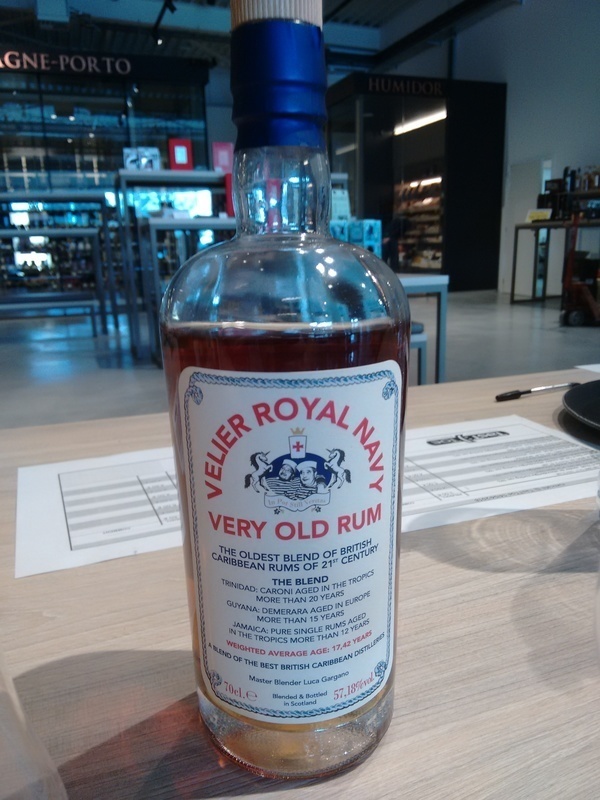 Have you found an online vendor selling Velier Royal Navy Very Old Rum? The color of this rum is nice, muted brownish gold, being the result of the actual barrel aging instead of the usual caramel addition. The label gives detailed information about the components in the blend, as well a playful pseudo-Latin motto "In Pot Still Veritas". The smell carries the unmistakable Caroni component - a dusty, abandoned attic with lots of old sawdust, old leather, but also some stone fruit, marmelade, and earthy tones. Overall very pleasant, damp, muted, sweetish aroma. Due to the high proof of the blend, adding some water is recommended to free the aromatic components from the alcoholic dilution and to lessen the numbing effect strong alcohol has on the tongue. The taste of the rum is absolutely fenomenal. Although the three components of the rum (heavy, austere, tar-like Caroni, sweetish and earthy Demerara and the funky, fruity Jamaican) are very distinct and overpowering if left unrestricted, none of them dominates the blend, they are all distinctly noticeable, but stay in line to provide a collective effort that delivers a fairly exceptional sensory experience. The initial sweet, playful, fruity attack slowly dries up, transitioning through the funky fruit from the Jamaican rum to the slightly austere, tannic end of the Caroni. The finish is not as long as I expected, or as one of a single barrel Caroni I had the pleasure to taste, but due to the exceptional harmony and balance of the blend, I can only talk about this rum in superlatives. This rum is a true testament to Mr. Gargano's mastery of the blending craft, and a tangible proof that he really knows his business like nobody else. Well done indeed - although the rum was relatively pricy, I do not regret spending the money to be allowed to experience this rare treat. The rum is also a kind of swan song to a rum era gone past - an era of extreme diversity and richness of various traditions surviving for decades or even centuries in some cases in the distilleries like Caroni, Hampden, Enmore, Port Mourant and others. Today, Caroni distillery is no more, all the various Guayana distilleries consolidated into Diamond Distillery that producdes mainly the heavily sweetened, commercialized El Dorado line, Hampden still produces superior funk bombs, but the contemporary, mainstream rum has became synonymous with sugar bombs like Diplomatico or Zacapa. Yet in this bottle, all those rich, distinct flavors and aromas rise up again, giving you the opportunity to taste the past will sadly never return. And although I suspect that the Navy would never spend so much on a brew for common sailors, I could imagine this rum would be a worthy and appreciated tot for a renowned naval officer or a wealthy overseas merchant. So, grab a bottle while they are available, and savor every drop! influence of Caroni, heavy, corpolent, very complex, long aftertaste, great flavour...one of the best rum I've ever tasted! Great job Ruruki Gargano! Dark amber color. This rum from Velier is a blend of the best of Trinidad (Caroni), Guyana (Demerara) and jamaica (Hampden). The nose opens with classic exotic fruit notes from Jamaican rums. Over time, we arrive on more greedy notes and it is Guyana that arrives slowly. It's well done, subtle. On the palate, it rises while still very greedy, we finally arrive on an explosive final with the Caroni finally arrives with this oil side. It sticks in the mouth but it is superbly done. This is for me a perfect blend, better than the triptych from Foursquare. Here we have the perfect balance between three monsters with very distinct personalities but once assembled gives a real wonder. It was a long time since I had tasted such a good blend. Sehr voll und kräftig mit schönen Fassaromen. Leider scheint ein nicht geringer Anteil aus Jamaica Rums zu bestehen, was mir leider nicht so gefällt. Die entsprechenden Noten sind zwar nicht extrem aufdringlich, aber dennoch deutlich wahrzunehmen. Guter Rum, aber leider nichts für mich. Der Alkohol hätte auch etwas besser eingebunden sein können, aber das ist auf hohem Niveau gemeckert.